Sky Cottage sits right in the very heart of highland Perthshire and this 5 star self catering cottage offers exceptionally comfy accommodation for couples looking for a special treat. This is the ideal place for a romantic weekend break, a honeymoon, a mid week getaway or a longer stay and the opportunity to really chill out. With views down Loch Tay to Kenmore, the cottage has an enviable position. It is set amidst 50 acres of private woodland and wild meadow with frontage onto the loch. The light is fantastic and the ever changing weather against the ancient trees and huge open views creates an atmosphere perfect for romance. This is a special place to get away from it all and have a chance to relax and dream a little. Perthshire is a great foodie destination! Nearby there's an interesting organic food shop at the quaintly named village of Dull, a farm food shop in Aberfeldy, and House of Menzies has a magnificent selection of New World wines. At Kenmore the little post office and store keeps all the basics and is open 7 days a week. In the immediate area there are restaurants at Ardeonaig, a few miles down the loch, and at Weem and Fortingall, both near Aberfeldy. There are Farmers' Markets in Aberfeldy (May-Oct), Perth (year round) and a Country Market at Logierait (April-Oct) all selling fabulous local produce. Highland Perthshire is a wonderful place to visit: lochs, forests and mountains, castles, history and whisky, walking, fishing and golf. The surrounding area is rich in ancient history, natural heritage and folklore. Visit the yew in the church yard at Fortingall believed to be Europe's oldest tree or find out more about ancient settlers at the Scottish Crannog Centre. Explore some of the beautiful gardens both private and public. Perthshire has activities and attractions to suit every taste and a week is not long enough to sample them all. But if all you want is some peace and quiet and relaxation, then all you need to do is stroll down to the loch, pull out a couple of deckchairs from the 'bathing hut' and let your cares slip away. Scotland is a perfect destination for a honeymoon or a romantic break and this luxury accommodation is idyllic. Sky Cottage has a Provençal feel, with painted furniture and soft colours, and stunning views from the floor to ceiling windows of Loch Tay and the magnificent surrounding mountains. Upstairs, the charming double bedroom faces south and has carefully positioned windows so you can lie in bed and watch the sun rise over Loch Tay. The fabulously comfy king size bed is made up on arrival with crisp, white Egyptian cotton bed linen and swiss chocolates on the pillows. The bedroom has good storage space, a hair drier and an alarm clock. There's a spacious bathroom with under-floor heating and a large walk-in shower. The bathroom is supplied with luxury hand soap and there are plenty of loo rolls and a heated towel rail and shaver socket. The living room has a log burning stove, comfortable sofa and chairs, cushions and throws. There is a flat screen TV, DVD player and hi-fi with i-pod and data port; plus plenty of books, games and DVDs. The kitchen is white and modern with deep work surfaces and soft close drawers. There's everything you'll need from Neff hob and oven, fridge and dishwasher to mini Magimix, even lobster picks and an oyster knife. The cottage is also equipped with a Hoover, a washing machine, airing cupboard and drying rack, ironing board and iron. Sky Cottage is just two hours' driving from Glasgow airport and fractionally less from Edinburgh. There are railway stations at Pitlochry and Dunkeld, on the main Inverness line, both within about 45 minutes' driving. The city of Perth is one hour's drive to the south, Inverness two hours to the north. The price includes beautiful crisp Egyptian cotton bed sheets, bath sheets, hand towels and gowns, electricity and logs. Also included is a welcoming bottle of prosecco, chocolates, tea, coffee, herbs, spices and olive oil. There are also cleaning things, washing up liquid, dish washer tablet, washing powder, firelighters and matches. To book this 5 star romantic holiday cottage in Perthshire, click the enquiry button below and see availability and prices. 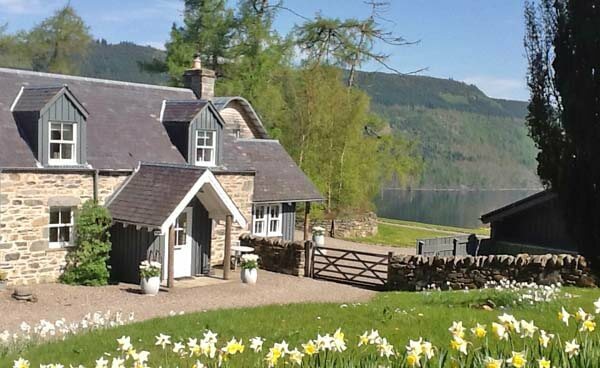 This is an idyllic Scottish cottage, set on the shores of Loch Tay in an enviable position looking down the loch. The stunning accommodation offers true luxury for a couple, whether renting a honeymoon cottage or looking for a special self-catering property for a relaxing break in Perthshire.